I was recently interviewed by Lisa Gill for the Leadermorphosis podcast exploring the emerging world of self-management and progressive organisations. 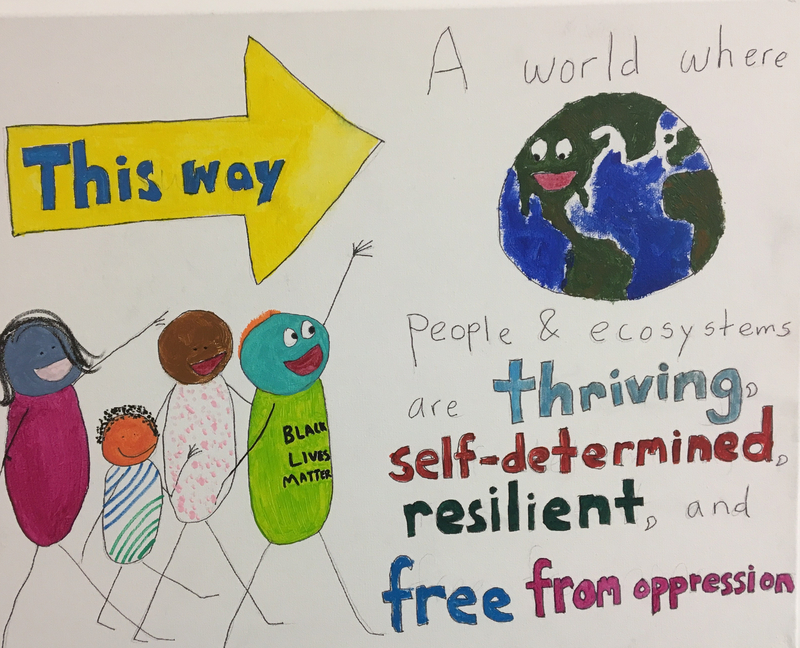 This header features two of my case study organisations – the wonderful folk from the Sustainable Economies Law Centre and a quote from Friends of the Earth Melbourne on what decentralised governance takes. Here is the interview. A lot packed into one interview. I thoroughly enjoyed and appreciated it. It’s a great entry to the context, purpose and methods of Sarah’s work, which I’m very interested in. It truly was a relief to see how well she laid out (here and elsewhere) the academic precedents she follows from. For me, if in my research I’m not interacting with others in a way that allows spirit to freely flow, and for everyone in the conversation to be prepared for surprises at all times … I’m not interested. I’ll now be keenly following Sarah’s and your work. BTW – I transcribed this podcast as part of my process of slow savoring. I’ll post it in another comment block, in case you’d find it useful. self-organizing teams and progressive organizations. LG: Hello, and TY for listening to L’M. I’m Lisa Gill and my guest this week is Sarah Houseman, who is an educator, a researcher, an entrepreneur in Melbourne, Australia. 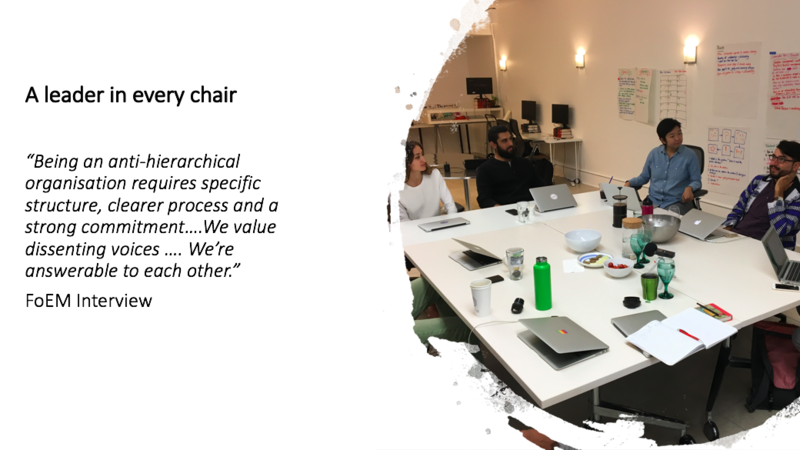 I was introduced to Sarah by Simon Mont who I had on the podcast a while ago and we were talking about how we need to change more than just the structures of our organizations if we really want them to shift. of 4 non-hierarchical NGOs. What’s also interesting is the WAY Sarah’s done her research. embodied learning in the research that she’s done. and also who’s doing the studying. It’s really a rich conversation, so I hope you enjoy it as much as I did. and I guess … why now? What is sortof compelling you to dive into this at this stage? That’s a good Q, Lisa. I’ve had a career in organizational leadership, having undertaken a range of executive roles, mainly in small to medium enterprises. And, having spent the last couple of years reading about organizations, I think we all know what isn’t working. I also have confidence, though. I’m confident that we CAN govern organizations better. And I take seriously the MUCH quoted statement from Einstein that says we can’t solve our problems with the same thinking we used to make them. looking and trying to tweek the current system, and expecting transformation, will not lead to a massive change. So I started my enquiry by really taking a v BIG perspective, which is the challenges of a thing called the anthropocene epoch. The “A”, while it’s a contested idea, calls for humans to operate with greater awareness of Earth’s life-supporting complex and interrelated systems. SH: Yes, … well, picked them is an interesting word. organizations they would recommend as being COMPETENT in their horizontal structure. And I was actually amazed, Lisa, at how hard it was to find organizations. 4:51 Um, one of them, the Enspiral Foundation was recommended to me by someone in the UK. And, they didn’t know them, they just heard of them, so that was one — the Enspiral Foundation, based in Wellington, but very much a global network. Another was the Sustainable Economies Law Center, in Oakland California. One very local to me here in Melbourne, in Australia, is Friends of the Earth, Melbourne. 5:20 And I’ve known then for a number of years, and was familiar with their different way of organizing, so that one was easy. And the 4th one was the Pachamama Aliance, in San Francisco, and that organization I’ve also had a long-term relationship with as a donor, and also a participant in their work, so I knew some of their journey as well. But it was very difficult to find organizations that really were involved and doing this. And one of the ones that might SEEM like they were, or they would naturally BE non-H actually still were adopting very traditional structures. also focusing my attention on not for profit org’s who have a commiitment — a mission — for social, political, legal and environmental change. Cause I was interested in that … I suppose the juxtaposition or the congruence between what the mission is for the world — what we’re trying to change as an organization, and then how we structure ourselves, and our relationships with staff and stakeholders. And the work of Otto Scharmer, and Jean Gebser are two of my favorites. I go to their work to find a sense of where we might be going. But then I look at the organizations, and I think of how I work in organizations, and we don’t necessarily hold those models, 7:41 where we’re in practice. We tend to be habitual, and pragmatic, as well as responsive to things outside of ourselves, and constrained by our community — our particular culture. So, part of this research really is about noticing the lived experience of the non-H Org. And THEN reflecting back to the work of Otto Scharmer, or Jean Gebser. LG: So, Sarah, I know you intentionally used some creative tools, and perhaps a different approach in the research methodology for your PhD. Can you say a little bit about what some of those creative tools were, and what the rationale behind using different research tools was. There are a number of elements to creative processes. 9:20 and I think there are some keys, if anyone is thinking of engaging with them. I was very satisfied to see many of the …. in fact all 4 of the organizations, expressing a lightness of being in their governance practices. It might be power related to gender, power related to roles, and being prepared to talk, not maybe as part of the everyday organizational sortof … make decisions, move our projects on, but having these conversations from time to time to understand power. The 4 organizations I worked with were, of course, all colonial countries … Australia, New Zealand and North America. And these organizations are very willing to understand …’What is the impact of being brought up within a colonized country?’ ‘How do we become aware how we perpetuate colonizing, particularly if we are white and male, or white and female in a different way, but there’s relationships with people who have less privilege than ourselves. So, that conversation was alive and possible. And the things that I really 23:03 noticed was that those conversations were undertaken without people becoming upset or offended. 23:11 They might take time to process, or not be ready to continue to talk about it, but people took responsibility for their learning and engagement. LG: So it’s really interesting, because you started to touch on, you know, those kinds of conversations about positional power and self-awareness. What are some of the other ‘human skills’ that you found these organizations were conscious about developing, that, you know, other organizations or people could learn from? 23:43 Like, what skills from a human and relational perspective do you think are important to cultivate in order to work in more non-H ways? SH: The human skills really speak to a major difference that I observed in a non-H organization, which is the commitment to interior work. 24:04 By that I mean, you know, ME work or YOU work works on the things that you react to, becoming, I suppose, more self aware of who we are and how we are. And that’s a pretty big change from an ordinary organization, where really our interior state is our own business. But here, we’re bringing more of ourselves to work. One of them was to sit together, in circle – which is a very important non-H symbol in its structure, there’s no edges there — to sit in circle together daily. It might be over lunch, in meetings — but there was a sense of meeting together. And, there’s a lot of conversation about listening. The skill of listening really is something that has to be cultivated. Because within listening, we have the question of how we listen. So, I notice people using a phrase like ‘I’m curious about …” And that instantly opens a conversation a different way than a repartee, where I’m having to defend myself more. That really gave people time, time to listen to many aspects of each issue. an opportunity for our organization to respond to in a very proactive and beneficial way. The goal of bringing shadows into the light is the insights and the new opportunities and the great power that comes through integration. Shadows aren’t necessarily negative. They are really just unconscious. and b’c they’re unconscious, b’c they’ve been put outside the sense ‘this is who we are,’ they can be emotionally strong trigger points. And I think that’s what I found with the organizations in different ways. 30:01 And I suppose the context we have to think about with non-H organization is, will a non-H organization fit with the dominant hierarchical system it’s part of? Because it has to exist w/i this world. It has to make money, it has to keep on growing, it has to communicate itself, when it’s slightly wierd. One thing that came up fairly consistently 30:30 was a sense of unease, or just putting to the side the whole issue of money and marketing yourself. 30:38 And it was particularly for some NGOs, it can be seen as a bit of a mucky thing, you know, you can be contaminated by that terrible stuff. Yet, money is needed to function in society. That was one aspect of money. Another aspect of money was, ‘How do we communicate our benefits when we are so different?’ Is there a clear way that we can say, ‘Invest in this, even though – or donate your money to this – even though it doesn’t look and feel the same way.’ So, developing a way of selling the value of the structure felt a bit like a challenge, 31:24 because it felt like it was something that might, if you were making a transition from hierarchy to non-H, it’s something that takes time. Another shadow that definitely emerged was a fear of hierarchy, because of course hierarchy is the opposite to, in some ways. And, so what do we do when there are natural hierarchies? One thing that was a very interesting shadow, again this was consistent, was the quetion of founders. 32:00 And this issue didn’t emerge with the founder themselves. They were usually unaware of it being a concern. It more emerged as a sense of concern or worry that the founder … what would happen when that founder moved on? And so it really showed up that that visionary leadership of the founder still impacts in a non-H environment. I think that one’s got a lot more to be explored. And I think there are others, also, starting to see that as a bit of a thread. Another aspect of shadown which really marks the horizontal organization is the issue of responsible accountability, particularly when we look at 33:29 the power of relationship between these people in these organizations. Giving feedback without the protection of hierarchy, and without damaging those relationships emerged as a challenge. I think this is a challenge for personal skills and harks back to the importance for human skills, but also, it shows up the importance of collective agreements about deliverables with projects and tasks. And it calls for even greater clarity than in a hierarchy for personal boundaries. The competition and winning is a way of approaching the world that we’ve all been brought up to excel at if possible 34:21 and we’ve been nurtured and rewarded to compete and to win. So, in a non-H environment, those qualities of winning can be banished as ‘that’s not us!’ 34:34 But then there’s a deficit, because we also need to celebrate successes and collectively share the success. So that’s another … I think a learning edge or a tension for some non-H organizations.